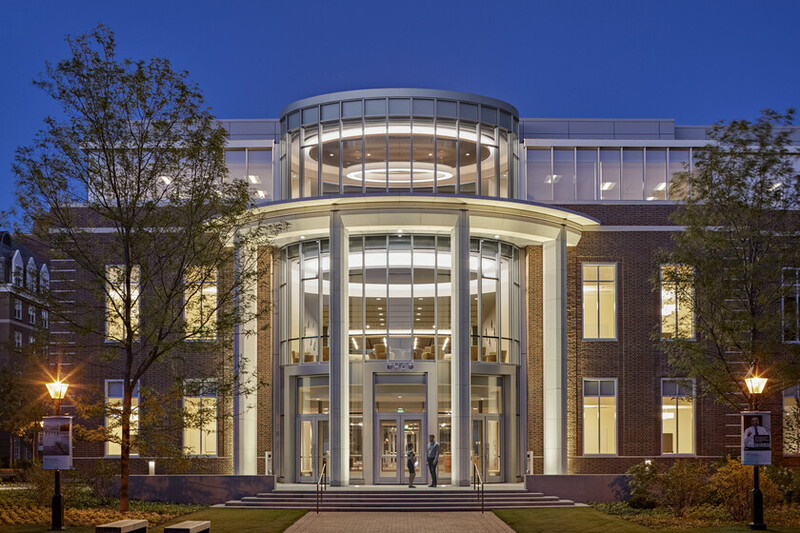 Designed and constructed to exceed Harvard’s Green Building Standards and achieve LEED v2009 Gold certification, the project is the new Executive Education dining facility on the HBS campus and will serve as a central hub for dining, interaction, learning, and socializing. 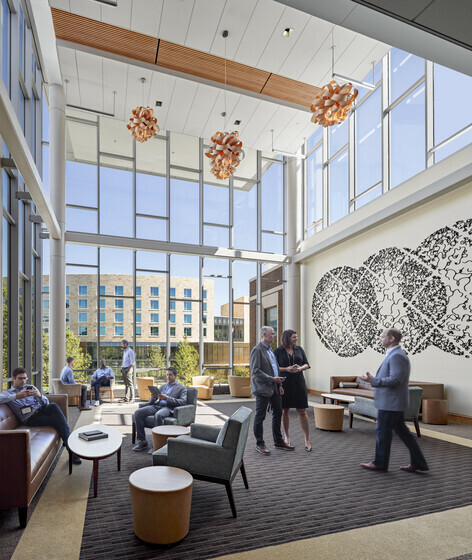 The integration of light, space, and materials provides an invitingly warm visual experience for visitors to the newest Executive Business Education Center. 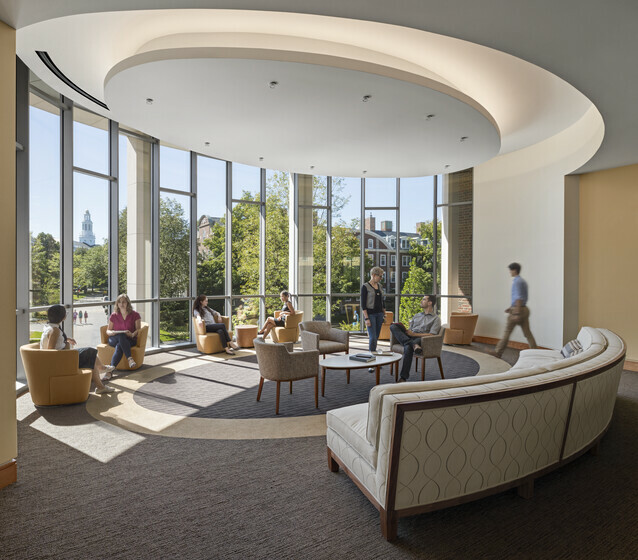 Glowing coves and over-sized custom pendant luminaires attract visitors to relax and interact in the cylindrical gathering areas. 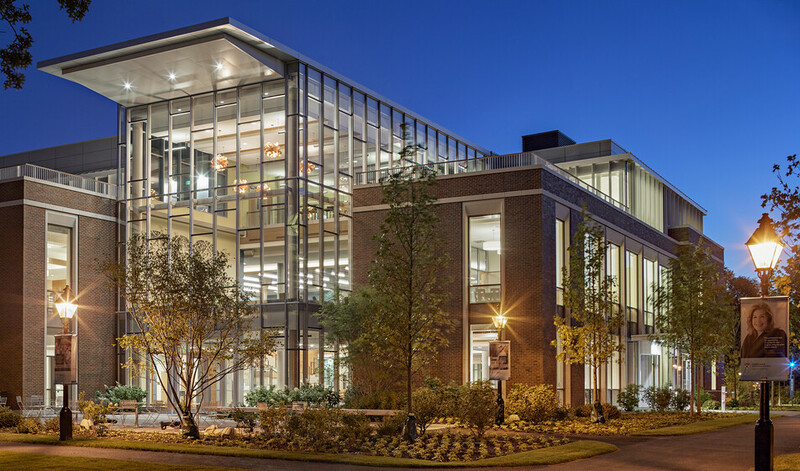 A traditional, brick-clad façade looks out onto the main campus while the other side reveals a sleek, modern atrium behind a glass curtainwall. The lighting elements were designed to reinforce this dual identity using carefully selected LED luminaires to provide suitable elegance, performance, and durability. The success of the design depended on the careful coordination of lighting mounting details with the wood and plaster ceilings, architectural coves, and special wall finishes. 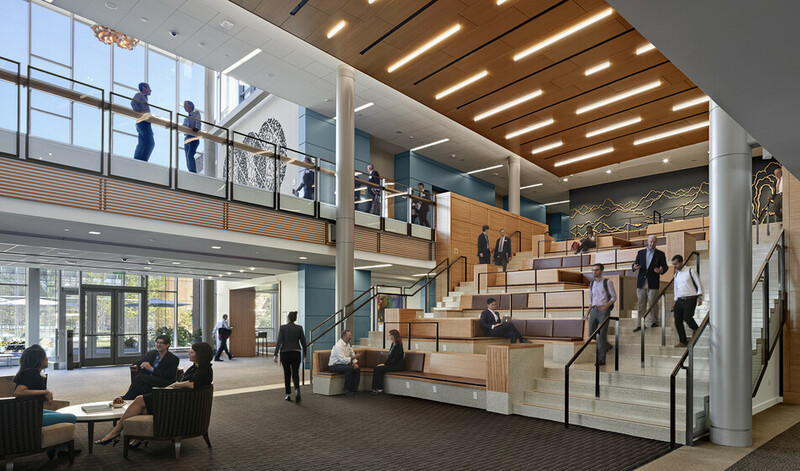 Atelier Ten supported the design team in developing a building envelope that maximizes daylight and views, insulates the building well, and improves indoor comfort while reducing energy use. With ambitious energy performance goals, Atelier Ten assessed energy efficiency measures, in addition to the high-performance envelope, that included a green roof, energy recovery and active chilled beams in certain spaces, external shading, and efficient lighting systems with predominantly LED fixtures and daylight dimming sensors. 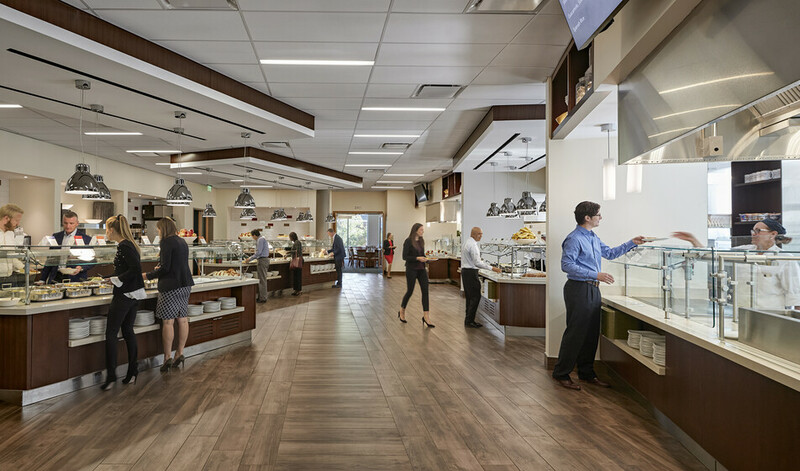 The Chao Center incorporates an energy efficient dining operation with a kitchen, bakery, servery, and multiple dining spaces. Kitchen spaces are outfitted with Energy Star kitchen equipment, water cooled refrigeration systems, variable air volume, and demand-controlled exhaust hoods. 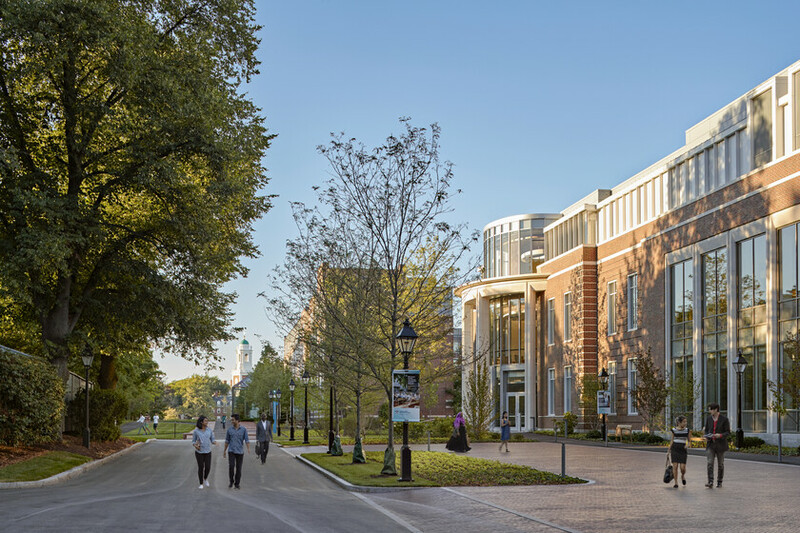 To further reduce energy, the building is supplied with renewable electricity from the 65.5 kW rooftop photovoltaic system, and hot water from the solar thermal system on the roof of the adjacent HBS Esteves Hall. The project will cost nearly 40% less to operate compared to the Baseline Design.